Brazil opened their Olympic campaign by stuttering to a disappointing 0-0 draw against South Africa in Brasília last night. This match and indeed this competition was meant to signal an era of optimism- or something close to it. An exciting young team with an attack and a midfield to match anything the senior side has fielded in the last 3-4 years, with a sprinkle of Neymar’s fairy dust added to the mix. With an attacking trio of Gabriel Barbosa, Neymar and Gabriel Jesús- who confirmed a £32m move to Manchester City this week- this was meant to signal a clean break from the drudgery of the Dunga era. In Rogerio Michale, Brazil also has a popular manager for this crop and with Tite- comfortably Brazil’s best coach- taking over the reigns of the senior team in September, South Africa were supposed to be sacrificed at the altar of Brazil’s new era. 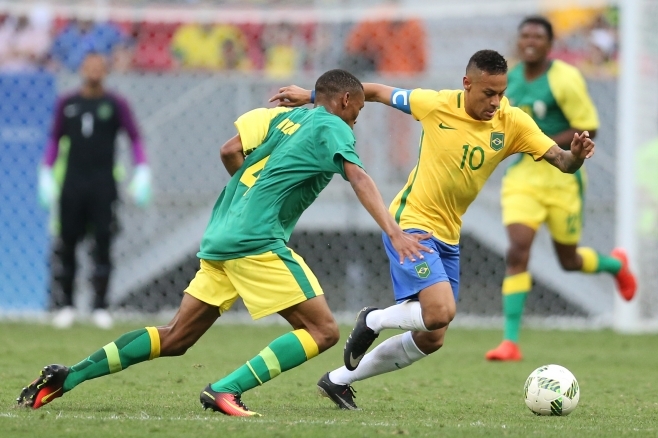 When the sides met in a friendly in March, Brazil comfortably swept South Africa aside by three goals to one. But on this occasion, the visitors proved to be far more obstinate opponents. Far from signalling an exciting new epoch, this side seemed to succumb to all of the flaws of the senior side. The unbearable carriage of pressure and expectation began to tell as the game wore on. Far from leading this exciting young group, the senior players, Renato Augusto, Neymar and Weverton, seemed to unbalance a squad that has become close knit over the past two years. In midfield, it was difficult to believe that Santos’ Thiago Maia was 9 years Renato Augusto’s junior. Thiago zipped around the pitch, making interceptions and telling passes, whilst Renato Augusto, who joined the squad late, was rendered a mere passenger. The centre halves looked unusually nervous, as did ‘keeper Weverton, who was far from a reassuring presence. The attraction of a Neymar, Gabigol and Gabriel Jesús front three lies in its potential interchangeability. Each player is capable of playing all across the front line and in Saturday’s friendly against Japan; the trio did so quite nicely. Brazil started brightly enough against a stubborn Bafana Bafana side. Felipe Anderson patrolled the pitch looking to find angles. Gabigol thirsted for the ball, but South Africa held a firm block, funnelling Brazil’s attacks out wide. This meant that Zeca and Douglas Santos were left to swing futile crosses into an area packed with green shirts. Brazil looked far more dangerous when Douglas Santos opted to cut the ball back and pick teammates out, or when Felipe Anderson roamed in central positions. South Africa carried a threat on the counter attack too, as they attacked the space vacated by full-backs Zeca and Douglas Santos. The game was perhaps tougher than Brazil had imagined when they traipsed into the tunnel at half-time, but surely with a little patience and some sharper movement from the front three, they would find their breakthrough. But as time ticked down, Brazil’s frustration increased and they began to succumb to what many corners of the Brazilian press have nicknamed “Neymar-dependência.” The front three became static and stopped swapping positions. The captain demanded the ball at every turn and he got it too. The Seleção’s forays became stale and predictable. Funnel the ball to a furiously signalling Neymar on the left and watch the captain try to eke out angles from which to cut in on his right foot. Wash, rinse and repeat. The Seleção improved a little half way through the second half. South Africa’s Mothobi Mvala was sent off with half an hour to go, Rogerio replaced the ineffective Renato Augusto with Rafinha and also sent for Grêmio’s Luan, whose direct running transformed Brazil temporarily. But as desperation took hold, Neymar saw more of the ball and Luan faded into the background, just as Felipe Anderson and Gabigol had been marched into the shadows by the spectre of the captain. In the long term Tite has a big problem turning Neymar back into a team player in the canary yellow shirt, but in the short term, it’s Rogerio’s job to re-emphasise the collective and bring the best out of Brazil’s top heavy team. Anxiety undoubtedly played a part, as Neymar admitted in his post match interview. The three senior players seemed to suffer more than their junior counterparts in that respect. Brazil had the chances to nick this contest 1-0, but South Africa were comfortable and organised for large swathes of the game. With the other fixture in the group, Denmark and Iraq, also finishing goalless, this was hardly a disastrous result for the hosts. Neymar promised that first date anxiety will have disappeared when they face Iraq on Sunday evening. But as the team disconsolately trudged off to a chorus of boos, it all felt crushingly familiar, with the hosts again hostage to expectation and self-doubt. There is also the caveat that the likes of Renato Augusto and Neymar have never really played with this squad before, so it’s perhaps understandable that the team will need to feel its way into the tournament. But one can’t help feeling that they would benefit from relaxing a little; especially the captain.